Don’t let our headline fool you – early detection is best for any medical issue! 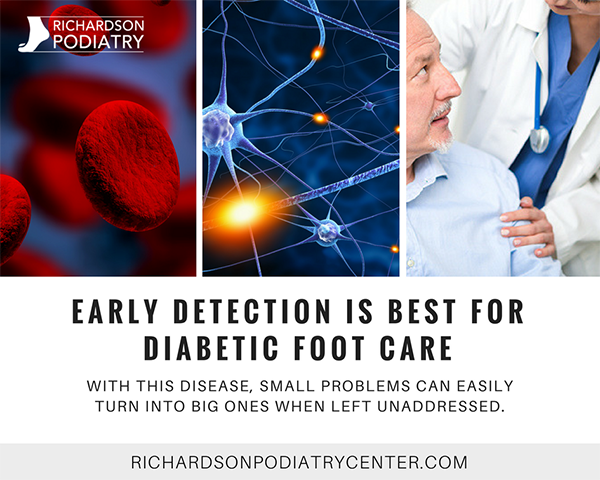 However, it does take heightened importance when it comes to diabetic foot care because with this disease, small problems can easily turn into big ones when left unaddressed. Here at Richardson Podiatry Center, we are proud to provide effective care to resolve countless foot and ankle problems for our patients. It is especially satisfying, though, to know we are able to help someone who has diabetes avoid potential problems as severe as limb amputation. How does diabetes create situations in which someone might eventually lose a toe, foot, or leg? Well, there are a couple of factors at play. One of the ways diabetes affects the body is by making it harder for blood to circulate. We refer to this as peripheral artery disease (PAD). Whereas PAD is a problem for getting oxygenated blood to any part of the body, your feet are the farthest from the heart. Essentially, PAD can make an already-long journey even more difficult. The problem with impaired circulation is that damaged body tissues need nutrients and red and white blood cells carried in the bloodstream for quick, complete healing. There is a second problem that can accompany diabetes and increase the risk for a dangerous situation to develop – peripheral neuropathy (nerve damage). Your body relies on peripheral nerves for many functions, including the ability to feel pain and recognize when an injury (or any other issue) has been sustained. What this all means is that diabetic neuropathy can take away your ability to be aware of a problem, and PAD prevents the body from being able to heal it properly. Wounds heal considerably more slowly (if at all), which provides opportunity for microorganisms to enter. As infection sets in, an immune system compromised by diabetes is unable to fight it off. When you can detect a problem early, though, you can do something about it. This will greatly reduce the risk of you developing a case of gangrene (tissue death) that necessitates amputation! Of course, taking measures to prevent issues from arising in the first place is the best possible situation. For this reason, diabetic foot care is centered on protecting your feet and using preventative measures to lower your risk of serious consequences developing. Clearly, it is difficult to overstate the importance of doing things like inspecting your feet every day, wearing diabetic socks and shoes, and, naturally, managing your blood sugar levels. If you live with diabetes, come to Richardson Podiatry Center so we can work with you to create a diabetic foot care plan to keep you healthy and safe. For more information, or to request an appointment, call (972) 690-5374.